City Hall will be closed & there will be no sanitation services on Thursday, November 24 & Friday, November 25, 2016. Happy Thanksgiving! 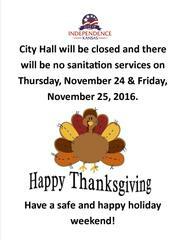 City Hall will be closed and there will be no sanitation services on Thursday, November 24 & Friday, November 25, 2016. Have a safe and happy holiday weekend!